In the 1980s and 1990s, 2 parallel streams of information accumulated related to focal brain degenerations. In 1982, Mesulam reported 6 patients with progressive aphasia, gradually worsening over a number of years, who did not develop a more generalized dementia. Since Mesulam's publication, numerous other cases have been reported, and Mesulam’s group has contributed additional reviews. [3, 4] This disorder, which is currently termed primary progressive aphasia (PPA), has gained acceptance as a syndrome. Hematoxylin and eosin stain of the left frontal cortex from a patient with primary progressive aphasia. This shows loss of neurons, plump astrocytes (arrow), and microvacuolation of the superficial cortical layers. Reproduced with permission of John Wiley & Sons, Inc. These descriptions included language abnormalities such as reduced speech output, mutism, echolalia, and perseveration. In recent years, the term frontotemporal dementia has become an umbrella term referring to clinical syndromes of frontal dementia or progressive aphasia. An alternate term, frontotemporal lobar degeneration, relates to pathologies associated with the frontotemporal lobe dementia syndromes. In this review, the 2 terms are used more or less synonymously. To date, most efforts have concentrated on diagnosing FTD and understanding its pathogenesis. Once the abnormal gene products are better understood, specific medical treatments may emerge. At present, however, medical treatment is extremely limited. Social interventions, counseling, and speech/language/cognitive therapy to facilitate the use of spared functions may make the condition easier to bear for the patient, caregivers, and family members. Whether behavioral interventions slow the progression of the disease remains to be proved. All current pharmacologic treatments are unproved, but selective serotonin reuptake inhibitor (SSRI) antidepressants and trazodone are widely recommended. [12, 13, 14] Cholinesterase inhibitors, approved for Alzheimer disease, are sometimes used in this condition, but there is no evidence that FTD involves a cholinergic deficit, and there is no clinical evidence of benefit. Anecdotally, some patients may improve in terms of memory, but others seem to worsen in behavior. Likewise, the drug memantine (Namenda) has been used in FTD, but 2 recent small clinical trials failed to confirm any benefit. [16, 17] It is hoped that future breakthroughs in the molecular biology and genetics of these disorders may lead to disease-modifying treatments. For patient education information, see the Brain and Nervous System Center, as well as Dementia Overview and Dementia Medication Overview. Tau is the major protein component of Pick bodies and is seen in a number of other neurodegenerative diseases, including progressive supranuclear palsy (PSP),  corticobasal degeneration, and the amyotrophic lateral sclerosis (ALS) ̶ Parkinson dementia disease complex of Guam. These other diseases can produce syndromes of primary language degeneration resembling PPA and FTD. Interestingly, no MAPT mutations have been found in Alzheimer disease. Until the past few years, more than 50% of cases of FTD, even the familial ones, were not associated with tau pathology, although many of these cases were also linked to chromosome 17. Most such cases have been noted to have ubiquitin immunoreactive inclusions in the cytoplasm or nucleus or ubiquitin immunoreactive neurites. This group has been designated frontotemporal lobar degeneration-ubiquitin (FTLD-U),  though as we shall see, this term is being replaced by reference to specific mutations. Tau and progranulin mutations appear to account for the most cases of FTD, and at least in familial cases, true examples of dementia lacking distinctive histologic features have become much less common. Moreover, other gene loci have been implicated in this family of disorders. Cases of inclusion body myopathy with Paget disease of the bone associated with FTD have been reported and have been associated with mutations involving chromosome 9, the valosin-containing protein (VCP) gene. [29, 30] In some of these cases, TDP-43 protein accumulation has been reported. Alzheimer disease, by far the most common dementing pathology, has also been associated with syndromes of PPA and FTD in some cases. [5, 39, 40, 41] Alzheimer disease is uncommonly found at autopsy in patients with primary progressive, nonfluent aphasia, but the association is more common in semantic dementia and is especially frequent in patients with logopenic progressive aphasia. The relationship of Alzheimer disease to the primary progressive aphasia syndromes is covered in more detail in the section on Primary Progressive Aphasia. In addition, there is now a recognized syndrome of “frontal variant Alzheimer disease”. The cause of frontotemporal lobe dementia (FTD) is unknown, but, as discussed earlier, significant evidence supports a genetic component to these syndromes. The molecular genetics of FTD has become much more complex in recent years. As mentioned above, the first genetic link in FTD was to markers on band 17q21-22, the gene locus for the tau protein. The tau gene marker has linked cases of FTD in several Dutch families, cases of hereditary dysphasic dementia reported in the United States, and a variety of other clinical syndromes called tauopathies, including familial parkinsonism with dementia, corticobasal degeneration, Pick disease without Pick bodies, and progressive supranuclear palsy (PSP). Overlap cases with these other tauopathies have been reported. The pathophysiology involves abnormal tau proteins, leading to the designation of FTD as one of a series of tauopathies. The exact prevalence of frontotemporal lobe dementia (FTD) is unknown. Among patients presenting with dementia who are younger than 65 years, the prevalence may be similar to or greater than that of Alzheimer disease. [49, 50] Some series based on brain pathology have estimated that FTD is responsible for as many as 10% of cases of dementia. In the United States, estimates are generally lower; FTD ranks after Alzheimer disease, vascular dementia, and Lewy body dementia in frequency of dementing illnesses. Frontotemporal lobe dementia (FTD), like all dementing illnesses, shortens life expectancy. The exact influence on mortality is unknown, and the rate of disease progression is variable. Among patients younger than 65 years, FTD has a similar or greater prevalence, as compared with Alzheimer disease. Among patients in their 70s and older, the prevalence of Alzheimer disease far exceeds that of FTD. The average age of onset for FTD, as reported by Westbury and Bub,  is younger than that of Alzheimer disease. The rate of progression from focal presentation to a more generalized dementia varies. The literature contains many cases of slowly progressive language dysfunction developing over a period of as long as 10-12 years, without obvious deterioration of other cognitive functions that would justify a diagnosis of dementia. Other patients progress to dementia within a few years. One area of controversy in PPA concerns whether a generalized dementia eventually develops in all patients with PPA. The incidence of dementia in patients with PPA is unknown, but it likely approaches 50% over several years. In the subset of cases of patients with FTD who develop motor neuron disease, the mortality rate is higher than for other FTD patients. Swallowing difficulty and aspiration pneumonia are especially common in this subgroup, but even patients with primary progressive aphasia (PPA) can develop dysphagia late in the course of the illness. For the subgroup of patients with frontotemporal lobe dementia (FTD) who have primary progressive aphasia (PPA), the presenting symptoms involve a deterioration of language function. [3, 4, 51] At first, other aspects of cognitive function and behavior may seem entirely normal. Pick first described the presentation of focal language deterioration as a sign of a dementing illness. Sporadic cases were presented into the 20th century, until Mesulam named the syndrome of PPA. Other authors, such as Kirshner et al  and Green et al,  described focal, aphasic presentations in patients who later showed signs of more general dementia. Patients with PPA who do not depend on their verbal skills for their livelihood may continue to function at work. They do not act forgetful, they remember their way to familiar destinations, and they generally comport themselves normally, although some show the behavioral changes described under FTD. Artistic expressions may even increase or be taken on as new hobbies in these patients, [52, 53] although, according to Miller and Hou,  their productions are often compulsive in style. The most common presenting symptom is word-finding difficulty. However, decreased fluency or hesitancy in producing speech, difficulty with language comprehension, and motor speech difficulties (eg, dysarthria) are also common. The descriptions of language syndromes in PPA have become more complex. The mode of presentation in PPA suggests a focal lesion of the left hemisphere language cortex, but a focal lesion, other than evidence of focal atrophy, is usually not found. Magnetic resonance imaging (MRI), especially when combined with voxel-based morphometry, has become much more accurate in mapping localized areas of cortical atrophy. Rohrer and colleagues suggested that MAPT mutations are more often associated with symmetrical atrophy, whereas the progranulin mutations show more asymmetric atrophy. There are also patterns of regional atrophy in the different FTD variants, which we will return to later. The course is progressive, with slowly worsening language function. In progressive nonfluent aphasia, speech is effortful and halting, with phoneme or speech sound errors; language production is simplified and agrammatic; and there is usually sparing of word comprehension and object knowledge, but often with impaired comprehension of syntax. This is, in other words, a Broca-like aphasia, often associated with dysarthria and with hesitant, groping speech and difficulty producing phonemes. These cases almost always have a non-Alzheimer pathology and most commonly a MAPT mutation or tau-based disorder. Rohrer and colleagues  reported that agrammatism and apraxia of speech were specifically useful in predicting the presence of a tau mutation and progressive nonfluent aphasia. Semantic dementia is a fluent aphasia with impaired naming and impaired knowledge of word meanings, such that even single word comprehension becomes affected. Patients often have surface dyslexia in reading, spared repetition and motor speech, and, sometimes, poor object and person knowledge. Semantic dementia was first named by Snowden and colleagues  and was later defined by Hodges and his group in the United Kingdom. [57, 58] The pathology can be variable, including mostly FTLD-U cases, many with progranulin mutations, but a few have been associated with Alzheimer disease. The logopenic, or logopenic/phonologic, variant of PPA involves impaired naming and single word retrieval, impaired repetition of phrases and sentences, and, often, speech sound errors, with spared motor speech, spared single word comprehension and object knowledge, and absence of agrammatism. 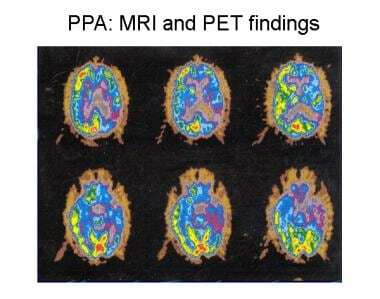 This type of PPA is usually associated with a focal presentation of Alzheimer disease. Patients with behavioral variant frontotemporal lobe dementia (bvFTD) may become disinhibited, developing a "witzelsucht," or fatuous sense of humor. Conversely, they may become apathetic, with little spontaneous speech or activity. They tend to neglect personal hygiene and to lose sensitivity to the effects of their behaviors on others. Some develop frank frontal lobe behavioral abnormalities, such as hyperorality, utilization behavior (ie, picking up and manipulating any object in the environment, appropriate or not), and inappropriate sexuality. Suggested criteria for the diagnosis of behavioral variant FTD have recently been published. These are discussed below. In the original descriptions of FTD, language function either is described as reduced in output (leading to muteness) or is characterized by perseveration, stereotyped responses, or even echolalia. A subgroup of patients with frontotemporal lobe dementia (FTD) develops signs and symptoms of motor neuron disease, such as fasciculations, muscle wasting and weakness, and bulbar symptoms. See above for the genetic basis of this syndrome. Specific ideomotor apraxia – Rare, except in patients with language difficulty associated with corticobasal degeneration (see below). Memory - Memory is usually preserved for orientation, although information retrieval may be difficult. Short-term memory deficits may be present in some patients but are less characteristic and early than those associated with Alzheimer disease. In a minority of patients, extrapyramidal signs, such as rigidity or even a full-blown parkinsonian syndrome of rigidity, akinesia, and tremor, may develop. These cases may overlap with Lewy body dementia, in which fluctuating mental status, early visual hallucinations, and REM sleep behavior disorder (acting out of dreams) are characteristic, along with mild parkinsonian motor symptoms. Widespread muscle atrophy, weakness, fasciculations, bulbar signs, and hyperreflexia may ensue in patients with motor neuron disease. Muscle weakness is also seen in the rare variant with inclusion body myopathy. As mentioned earlier, some patients may show artistic or musical talents, sometimes with greater expression than before the onset of the illness. Frontotemporal lobe dementia (FTD) is somewhat intermediate between focal disorders of the brain and more generalized neurodegenerative diseases. The most important differential diagnoses for FTD involve focal pathologies such as brain tumors, abscesses, and strokes, as well as Alzheimer disease, which is a more common dementing illness than FTD. In distinguishing between FTD and other focal lesions, gradually progressive onset, usually over years, is the key feature. Brain imaging studies are helpful in ruling out focal, destructive, or neoplastic lesions. Whitwell and colleagues used voxel-based morphometry on MRI to distinguish differing patterns of lobar atrophy in variants of FTD with and without motor neuron disease. See below under imaging for the contributions of MRI and positron emission tomography (PET) imaging to the diagnosis of FTD. Alzheimer disease can mimic almost any of the FTD variants when it presents with focal symptoms. Only a few cases of pathologically confirmed Alzheimer disease have been reported that presented with isolated nonfluent aphasia, but more have been described with the syndromes of semantic dementia (although most cases of semantic dementia have the pathology of frontotemporal lobar degeneration-ubiquitin [FTLD-U]) and with the logopenic variant of primary progressive aphasia (PPA), which is most commonly associated with Alzheimer disease. Other “focal” presentations of Alzheimer disease include the “frontal variant” referred to earlier and the “posterior cortical atrophy” variant, in which visual symptoms predominate. Kertesz et al suggested the term Pick complex to include the various non-Alzheimer pathologies, with or without Pick inclusion bodies and with or without motor neuron disease. This terminology has not become widely adopted, so we will continue to use the clinical term frontotemporal lobe dementia and the pathologic term frontotemporal lobar degeneration. Routine testing (eg, blood, cerebrospinal fluid) in frontotemporal lobe dementia (FTD) is usually unrevealing. The findings in electroencephalography (EEG) are commonly abnormal in FTD, often showing focal slowing of electrical activity over 1 or both frontal or temporal lobes. These findings are not sufficiently specific to be clinically useful, and, in general, EEG is less useful than functional brain imaging with PET scanning or even lobar atrophy on MRI. Other than brain imaging studies, the most specific tests for evaluating frontotemporal lobe dementia (FTD) are evaluation with standardized language batteries and neuropsychological testing. [68, 69] Such studies assess the specific pattern of language abnormality and the presence of other cognitive and memory deficits. Preservation of many of these functions distinguishes FTD and primary progressive aphasia (PPA) syndromes from Alzheimer disease. In distinguishing FTD from Alzheimer disease, the involvement of specific cognitive functions is the most important differentiating factor. Grossman pointed to a double dissociation between immediate and short-term memory in a comparison study of 4 patients with PPA versus 25 patients with presumed Alzheimer disease. Immediate memory was more impaired in PPA patients, whereas short-term memory deficits characterized the deficits of patients with Alzheimer disease. The frontal cortex, especially on the left side, is thought to be the site of working or immediate memory, whereas the hippocampus and other medial temporal structures, often affected early in Alzheimer disease, represent the site of short-term memory. Other cognitive functions also showed differences between the 2 groups. Patients with PPA were more deficient than patients with Alzheimer disease on tasks of syntactic and speech fluency, correlating with the aphasia, and they had more severe impairment of attention (eg, digit span), another measure of immediate memory. Patients with PPA showed preserved memory and visuospatial functions, whereas those with Alzheimer disease were almost invariably impaired in these functions. Atypical cases of Alzheimer disease can present with 3 “focal” syndromes: (1) aphasia, especially logopenic PPA, (2) a frontal syndrome resembling behavioral variant FTD, or (3)a visual-predominant form called posterior cortical atrophy. This issue of focal versus more generalized dementia, of course, harkens back to Pick’s original discussion of how neurodegenerative diseases progress. Recent evidence supports neuron-to-neuron transmission of pathology in both Alzheimer disease and FTD, involving transmission of the abnormal misfolded proteins of tau or beta-amyloid from neuron to neuron in a way reminiscent of the prion diseases like Creutzfeldt-Jakob disease. In other words, what eventually becomes a diffuse neurodegenerative disease has to start somewhere in the brain; it can start in one region of the brain and then spread, neuron to neuron, into unaffected areas. PPA is a syndrome, not a pathological diagnosis. Although the term initially implied a pathology other than Alzheimer disease, we must now consider that some cases may have a syndrome of PPA but a pathological diagnosis of Alzheimer disease, or vice versa. For example, in a series of 100 patients with focal presentations of dementing illness, 34 had autopsy-proved Alzheimer disease. These cases comprised 12 (44.1%) of 26, patients with progressive nonfluent aphasia (PNFA). In comparison, only 2 (7.1%) of 28 of the behavioral-variant FTD patients and 2 (10%) of 20 with semantic dementia had postmortem evidence of Alzheimer disease. Xiong and colleagues,  in a series of 33 autopsy studied cases of PNFA, 13 had Alzheimer disease pathology and 20 had FTD pathology. Four clinical features were useful in predicting FTD pathology: (1) age of onset before 60 years, (2) “sweet tooth”, or preference for sweet foods, (3) disinhibited behaviors, and (4) the presence of “knife-edge” atrophy in the frontal and/or temporal lobes. These features were only weakly predictive individually, but a majority of the FTD cases had at least one of the features, whereas most Alzheimer disease cases had none. Features that did not distinguish FTD and Alzheimer disease included progression to generalized dementia within 2 years (the defining characteristic in Mesulam’s original definition of PPA), presence of memory deficits (the usual presenting symptom in Alzheimer disease), or impairment of activities of daily living. In addition, onset before age 65 years did not distinguish cases of FTD and Alzheimer disease in thisseries, though the series had disproportionately young patients because of the authors’ interest in early dementia. Hu and colleagues  reported 19 patients with PNFA and 19 with logopenic progressive aphasia. Twelve of the 19 logopenic progressive aphasia patients and 6 of 19 PNFA patients had either autopsy confirmation or CSF biomarkers suggestive of Alzheimer disease. Naming was more impaired in the Alzheimer disease patients, whereas letter-based fluency was more impaired in the non–Alzheimer disease cases. Patient with progressive nonfluent aphasia. MRI showing focal, left temporal atrophy. Reprinted from Neurology in Clinical Practice, 4th ed. Kirshner H. Language and Speech Disorders. Copyright 2004, with permission from Elsevier. On MRI, temporal lobe atrophy is especially easy to detect in the coronal projections. Cases differ as to the relative degree of atrophy in the frontal or temporal lobe and on the left versus right side. Research studies using voxel-based morphometry have provided more precise maps of the areas of focal atrophy. Patients with frontal lobe neurobehavioral disorders (behavioral variant frontotemporal lobe dementia) often have bilateral frontal atrophy, especially involving the medial frontal cortex, sometimes with anterior temporal lobe atrophy as well. Patients with PNFA tend to have perisylvian, left hemisphere atrophy, involving the frontal lobe and insula, sometimes extending into the temporal lobe. Patients with semantic dementia typically have temporal lobe atrophy, often involving the anterior temporal lobes bilaterally. Patients with logopenic progressive aphasia often have bilateral superior temporal and inferior parietal atrophy. Patients with the related tauopathy progressive supranuclear palsy have midbrain tegmentum and superior cerebellar peduncle atrophy, and those with corticobasal degeneration have frontoparietal atrophy. Patient with progressive nonfluent aphasia. Positron emission tomography (PET) scan indicating hypometabolism of glucose in the left hemisphere. Reprinted from Neurology in Clinical Practice, 4th ed. Kirshner H. Language and Speech Disorders. Copyright 2004, with permission from Elsevier. 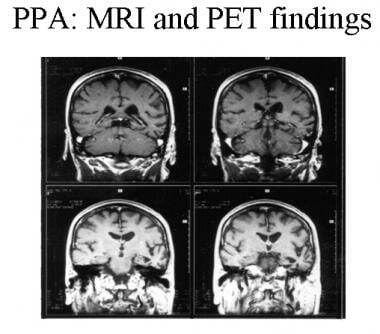 The Hammersmith PET facility in London published early studies by Tyrell et al demonstrating that left temporal hypometabolism was observed in virtually all early cases of primary progressive aphasia (PPA). More advanced cases also showed hypometabolism in the left frontal lobe and, occasionally, a lesser degree of hypometabolism in the right hemisphere. These patterns of cortical involvement have been confirmed in many subsequent studies. The pattern of frontal and/or temporal involvement is distinct from that of Alzheimer disease, in which both parietal lobes tend to show the earliest hypometabolism. New ligands used to bind to amyloid protein deposits (eg, Pittsburgh Compound B, or the recently approved florbetapir [Amyvid]) are helpful in the diagnosis of Alzheimer disease but not of FTD. These agents are approved by the FDA for safety but are not covered by Medicare or most private insurance policies. Considering first the cases of PPA, Pick disease was the first pathologic disease associated with this syndrome. This was reported with a description of the language syndrome in 1892. The neuropathologic features of Pick disease are focal, lobar atrophy of the frontal and/or temporal lobes of 1 or both hemispheres, prominent gliosis associated with swollen neurons, and/or argentophilic inclusions (Pick bodies). In the current era, several groups have reported cases of pathologically proven Pick disease. Holland et al,  Wechsler et al,  and Graff-Radford et al  have reported patients with pathologically proven Pick disease and progressive language deterioration. All patients described in these reports had slowly progressive language symptoms, with naming involved early. In all cases, enough cognitive functions were spared initially to make the disorder easily distinguishable from typical Alzheimer disease. Among the tau-positive patients, some develop symptoms and show pathologic criteria for corticobasal degeneration and others show overlap with the progressive supranuclear palsy (PSP) pathology. All of the pharmacologic treatments listed below must be considered investigational and not recommended for general use. Dopaminergic drugs have been tested in patients with transcortical motor aphasia secondary to strokes. Anecdotal experience with dopamine agonist agents such as bromocriptine (Parlodel), pergolide (Permax), pramipexole (Mirapex), and ropinirole (Requip) has been unimpressive. Bromocriptine and pergolide are no longer available. Stimulant drugs such as amphetamines and modafinil (Provigil) may benefit patients with frontal lobe syndromes. Large, randomized, double-blind studies are lacking. There is concern that the stimulant drugs might worsen behavior in patients with behavioral variant FTD. As stated previously, the last few years have witnessed major breakthroughs in the understanding of the molecular genetics of these disorders, and we hope that treatment breakthroughs will follow. What are the signs and symptoms of frontotemporal dementia (FTD)? How is frontotemporal dementia (FTD) treated? What causes frontotemporal dementia (FTD)? What is the role of tau protein in the pathogenesis of frontotemporal dementia (FTD)? What is the role of genetic mutations in the pathogenesis of frontotemporal dementia (FTD)? What is the link between Alzheimer&#39;s disease and frontotemporal dementia (FTD)? What is the link between amyotrophic lateral sclerosis (ALS) and frontotemporal dementia (FTD)? What is the genetic distribution of frontotemporal dementia (FTD)? What is the prevalence of frontotemporal dementia (FTD) in the US? What is the global prevalence of frontotemporal dementia (FTD)? Which patient groups are at highest risk for frontotemporal dementia (FTD)? What is the prognosis of frontotemporal dementia (FTD)? What are the signs and symptoms of primary progressive aphasia (PPA) in frontotemporal dementia (FTD)? What is progressive nonfluent aphasia in frontotemporal dementia (FTD)? What is semantic dementia in frontotemporal dementia (FTD)? What is logopenic progressive aphasia in frontotemporal dementia (FTD)? What are the changes in behavioral characteristic of frontotemporal dementia (FTD)? What are the signs and symptoms of motor neuron disease in frontotemporal dementia (FTD)? What are the signs and symptoms of less common frontotemporal dementia (FTD) variants? Which physical findings are characteristic of frontotemporal dementia (FTD)? Which conditions should be included in the differential diagnoses of frontotemporal dementia (FTD)? What is the role of lab testing in the diagnosis of frontotemporal dementia (FTD)? What is the role of language batteries and neuropsychological testing in the diagnosis of frontotemporal dementia (FTD)? What are the diagnostic criteria for the behavioral variant of frontotemporal dementia (bvFTD)? What is the role of imaging studies in the diagnosis of frontotemporal dementia (FTD)? What is the role of SPECT and PET scanning in the diagnosis of frontotemporal dementia (FTD)? 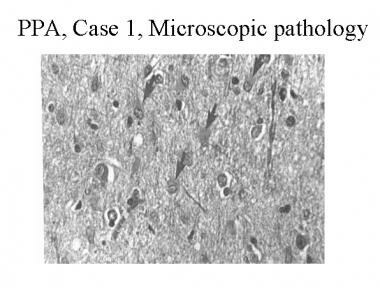 What histologic findings are characteristic of frontotemporal dementia (FTD)? What is the role of drug treatment for frontotemporal dementia (FTD)? Which medications are considered investigational and not recommended for general use in patients with frontotemporal dementia (FTD)? Mesulam MM. Slowly progressive aphasia without generalized dementia. Ann Neurol. 1982 Jun. 11(6):592-8. [Medline]. Weintraub S, Rubin NP, Mesulam MM. Primary progressive aphasia. Longitudinal course, neuropsychological profile, and language features. Arch Neurol. 1990 Dec. 47(12):1329-35. [Medline]. Mesulam MM. Primary progressive aphasia--a language-based dementia. N Engl J Med. 2003 Oct 16. 349(16):1535-42. [Medline]. Kirshner HS, Webb WG, Kelly MP, Wells CE. Language disturbance. An initial symptom of cortical degenerations and dementia. Arch Neurol. 1984 May. 41(5):491-6. [Medline]. Edwards-Lee T, Miller BL, Benson DF, Cummings JL, Russell GL, Boone K. The temporal variant of frontotemporal dementia. Brain. 1997 Jun. 120 ( Pt 6):1027-40. [Medline]. Josephs KA, Whitwell JL, Knopman DS, Boeve BF, Vemuri P, Senjem ML. Two distinct subtypes of right temporal variant frontotemporal dementia. Neurology. 2009 Nov 3. 73(18):1443-50. [Medline]. Neary D, Snowden J. Fronto-temporal dementia: nosology, neuropsychology, and neuropathology. Brain Cogn. 1996 Jul. 31(2):176-87. [Medline]. Neary D, Snowden JS, Gustafson L, Passant U, Stuss D, Black S. Frontotemporal lobar degeneration: a consensus on clinical diagnostic criteria. Neurology. 1998 Dec. 51(6):1546-54. [Medline]. Gorno-Tempini ML, Dronkers NF, Rankin KP, Ogar JM, Phengrasamy L, Rosen HJ, et al. Cognition and anatomy in three variants of primary progressive aphasia. Ann Neurol. 2004 Mar. 55(3):335-46. [Medline]. [Full Text]. Gorno-Tempini ML, Hillis AE, Weintraub S, Kertesz A, Mendez M, Cappa SF. Classification of primary progressive aphasia and its variants. Neurology. 2011 Mar 15. 76(11):1006-14. [Medline]. Moretti R, Torre P, Antonello RM, Cazzato G, Bava A. Frontotemporal dementia: paroxetine as a possible treatment of behavior symptoms. A randomized, controlled, open 14-month study. Eur Neurol. 2003. 49(1):13-9. [Medline]. Deakin JB, Rahman S, Nestor PJ. Paroaxetine does not improve symptoms and impairs cognition in frontotemporal dementia: a double-blind randomized controlled trial. Psychopharmacol. 2004. 172:400-8. Lebert F, Stekke W, Hasenbroekx C, Pasquier F. Frontotemporal dementia: a randomised, controlled trial with trazodone. Dement Geriatr Cogn Disord. 2004. 17(4):355-9. [Medline]. Huey ED, Putnam KT, Grafman J. A systematic review of neurotransmitter deficits and treatments in frontotemporal dementia. Neurology. 2006 Jan 10. 66(1):17-22. [Medline]. Boxer AL, Knopman DS, Kaufer DI, Grossman M, Onyike C, Graf-Radford N. Memantine in patients with frontotemporal lobar degeneration: a multicentre, randomised, double-blind, placebo-controlled trial. Lancet Neurol. 2013 Feb. 12(2):149-56. [Medline]. Vercelletto M, Boutoleau-Bretonnière C, Volteau C, Puel M, Auriacombe S, Sarazin M. Memantine in behavioral variant frontotemporal dementia: negative results. J Alzheimers Dis. 2011. 23(4):749-59. [Medline]. Knopman DS, Mastri AR, Frey WH 2nd, Sung JH, Rustan T. Dementia lacking distinctive histologic features: a common non-Alzheimer degenerative dementia. Neurology. 1990 Feb. 40(2):251-6. [Medline]. Kirshner HS, Tanridag O, Thurman L, Whetsell WO Jr. Progressive aphasia without dementia: two cases with focal spongiform degeneration. Ann Neurol. 1987 Oct. 22(4):527-32. [Medline]. Hutton M, Lendon CL, Rizzu P, Baker M, Froelich S, Houlden H, et al. Association of missense and 5'-splice-site mutations in tau with the inherited dementia FTDP-17. Nature. 1998 Jun 18. 393(6686):702-5. [Medline]. Poorkaj P, Bird TD, Wijsman E, Nemens E, Garruto RM, Anderson L, et al. Tau is a candidate gene for chromosome 17 frontotemporal dementia. Ann Neurol. 1998 Jun. 43(6):815-25. [Medline]. Morris JC, Cole M, Banker BQ, Wright D. Hereditary dysphasic dementia and the Pick-Alzheimer spectrum. Ann Neurol. 1984 Oct. 16(4):455-66. [Medline]. Josephs KA, Petersen RC, Knopman DS, Boeve BF, Whitwell JL, Duffy JR, et al. Clinicopathologic analysis of frontotemporal and corticobasal degenerations and PSP. Neurology. 2006 Jan 10. 66(1):41-8. [Medline]. Kersaitis C, Halliday GM, Xuereb JH, Pamphlett R, Bak TH, Hodges JR, et al. Ubiquitin-positive inclusions and progression of pathology in frontotemporal dementia and motor neurone disease identifies a group with mainly early pathology. Neuropathol Appl Neurobiol. 2006 Feb. 32(1):83-91. [Medline]. Baker M, Mackenzie IR, Pickering-Brown SM, Gass J, Rademakers R, Lindholm C, et al. Mutations in progranulin cause tau-negative frontotemporal dementia linked to chromosome 17. Nature. 2006 Aug 24. 442(7105):916-9. [Medline]. Cruts M, Gijselinck I, van der Zee J, Engelborghs S, Wils H, Pirici D. Null mutations in progranulin cause ubiquitin-positive frontotemporal dementia linked to chromosome 17q21. Nature. 2006 Aug 24. 442(7105):920-4. [Medline]. Bigio EH. Update on recent molecular and genetic advances in frontotemporal lobar degeneration. J Neuropathol Exp Neurol. 2008 Jul. 67(7):635-48. [Medline]. Yu CE, Bird TD, Bekris LM, Montine TJ, Leverenz JB, Steinbart E. The spectrum of mutations in progranulin: a collaborative study screening 545 cases of neurodegeneration. Arch Neurol. 2010 Feb. 67(2):161-70. [Medline]. Forman MS, Mackenzie IR, Cairns NJ, Swanson E, Boyer PJ, Drachman DA. Novel ubiquitin neuropathology in frontotemporal dementia with valosin-containing protein gene mutations. J Neuropathol Exp Neurol. 2006 Jun. 65(6):571-81. [Medline]. Watts GD, Wymer J, Kovach MJ, Mehta SG, Mumm S, Darvish D, et al. Inclusion body myopathy associated with Paget disease of bone and frontotemporal dementia is caused by mutant valosin-containing protein. Nat Genet. 2004 Apr. 36(4):377-81. [Medline]. Hosler BA, Siddique T, Sapp PC, Sailor W, Huang MC, Hossain A. Linkage of familial amyotrophic lateral sclerosis with frontotemporal dementia to chromosome 9q21-q22. JAMA. 2000 Oct 4. 284(13):1664-9. [Medline]. Mahoney CJ, Beck J, Rohrer JD, Lashley T, Mok K, Shakespeare T. Frontotemporal dementia with the C9ORF72 hexanucleotide repeat expansion: clinical, neuroanatomical and neuropathological features. Brain. 2012 Mar. 135(Pt 3):736-50. [Medline]. Renton AE, Majounie E, Waite A, Simón-Sánchez J, Rollinson S, Gibbs JR. A hexanucleotide repeat expansion in C9ORF72 is the cause of chromosome 9p21-linked ALS-FTD. Neuron. 2011 Oct 20. 72(2):257-68. [Medline]. Bigio EH. Motor neuron disease: the C9orf72 hexanucleotide repeat expansion in FTD and ALS. Nat Rev Neurol. 2012 May. 8(5):249-50. [Medline]. Liu Y, Yu JT, Sun FR, Ou JR, Qu SB, Tan L. The clinical and pathological phenotypes of frontotemporal dementia with C9ORF72 mutations. J Neurol Sci. 2013 Dec 15. 335(1-2):26-35. [Medline]. Skibinski G, Parkinson NJ, Brown JM, Chakrabarti L, Lloyd SL, Hummerich H, et al. Mutations in the endosomal ESCRTIII-complex subunit CHMP2B in frontotemporal dementia. Nat Genet. 2005 Aug. 37(8):806-8. [Medline]. Urwin H, Josephs KA, Rohrer JD, Mackenzie IR, Neumann M, Authier A. FUS pathology defines the majority of tau- and TDP-43-negative frontotemporal lobar degeneration. Acta Neuropathol. 2010 Jul. 120(1):33-41. [Medline]. Neumann M, Rademakers R, Roeber S, Baker M, Kretzschmar HA, Mackenzie IR. A new subtype of frontotemporal lobar degeneration with FUS pathology. Brain. 2009 Nov. 132(Pt 11):2922-31. [Medline]. Green J, Morris JC, Sandson J, McKeel DW Jr, Miller JW. Progressive aphasia: a precursor of global dementia?. Neurology. 1990 Mar. 40(3 Pt 1):423-9. [Medline]. Wolk DA, Price JC, Madeira C, Saxton JA, Snitz BE, Lopez OL. Amyloid imaging in dementias with atypical presentation. Alzheimers Dement. 2012 Sep. 8(5):389-98. [Medline]. Lehmann M, Ghosh PM, Madison C, Laforce R Jr, Corbetta-Rastelli C, Weiner MW. Diverging patterns of amyloid deposition and hypometabolism in clinical variants of probable Alzheimer's disease. Brain. 2013 Mar. 136(Pt 3):844-58. [Medline]. Stevens M, van Duijn CM, Kamphorst W, de Knijff P, Heutink P, van Gool WA, et al. Familial aggregation in frontotemporal dementia. Neurology. 1998 Jun. 50(6):1541-5. [Medline]. Wilhelmsen KC. Frontotemporal dementia is on the MAPtau. Ann Neurol. 1997 Feb. 41(2):139-40. [Medline]. Mesulam MM, Johnson N, Grujic Z, Weintraub S. Apolipoprotein E genotypes in primary progressive aphasia. Neurology. 1997 Jul. 49(1):51-5. [Medline]. Gustafson L, Abrahamson M, Grubb A, Nilsson K, Fex G. Apolipoprotein-E genotyping in Alzheimer's disease and frontotemporal dementia. Dement Geriatr Cogn Disord. 1997 Jul-Aug. 8(4):240-3. [Medline]. Seelaar H, Kamphorst W, Rosso SM, Azmani A, Masdjedi R, de Koning I, et al. Distinct genetic forms of frontotemporal dementia. Neurology. 2008 Oct 14. 71(16):1220-6. [Medline]. Majounie E, Renton AE, Mok K, Dopper EG, Waite A, Rollinson S, et al. Frequency of the C9orf72 hexanucleotide repeat expansion in patients with amyotrophic lateral sclerosis and frontotemporal dementia: a cross-sectional study. Lancet Neurol. 2012 Apr. 11(4):323-30. [Medline]. [Full Text]. Westbury C, Bub D. Primary progressive aphasia: a review of 112 cases. Brain Lang. 1997 Dec. 60(3):381-406. [Medline]. Warren JD, Rohrer JD, Rossor MN. Clinical review. Frontotemporal dementia. BMJ. 2013. 347:f4827. [Medline]. Grossman M. Primary progressive aphasia: clinicopathological correlations. Nat Rev Neurol. 2010 Feb. 6(2):88-97. [Medline]. [Full Text]. Miller BL, Cummings J, Mishkin F, Boone K, Prince F, Ponton M. Emergence of artistic talent in frontotemporal dementia. Neurology. 1998 Oct. 51(4):978-82. [Medline]. Miller BL, Hou CE. Portraits of artists: emergence of visual creativity in dementia. Arch Neurol. 2004 Jun. 61(6):842-4. [Medline]. Rohrer JD, Ridgway GR, Modat M, Ourselin S, Mead S, Fox NC, et al. Distinct profiles of brain atrophy in frontotemporal lobar degeneration caused by progranulin and tau mutations. Neuroimage. 2010 Nov 15. 53(3):1070-6. [Medline]. [Full Text]. Rohrer JD, Rossor MN, Warren JD. Syndromes of nonfluent primary progressive aphasia: a clinical and neurolinguistic analysis. Neurology. 2010 Aug 17. 75(7):603-10. [Medline]. Snowden JS, Goulding PS, Neary D. Semantic dementia: a form of circumscribed cerebral atrophy. Behav Neurol. 1989. 2:167-82. Hodges JR, Patterson K, Oxbury S, Funnell E. Semantic dementia. Progressive fluent aphasia with temporal lobe atrophy. Brain. 1992 Dec. 115 ( Pt 6):1783-806. [Medline]. Hodges JR, Patterson K. Semantic dementia: a unique clinicopathological syndrome. Lancet Neurol. 2007 Nov. 6(11):1004-14. [Medline]. Gorno-Tempini ML, Brambati SM, Ginex V, Ogar J, Dronkers NF, Marcone A, et al. The logopenic/phonological variant of primary progressive aphasia. Neurology. 2008 Oct 14. 71(16):1227-34. [Medline]. [Full Text]. Rascovsky K, Hodges JR, Knopman D, Mendez MF, Kramer JH, Neuhaus J. Sensitivity of revised diagnostic criteria for the behavioural variant of frontotemporal dementia. Brain. 2011 Sep. 134(Pt 9):2456-77. [Medline]. Mendez MF, Shapira JS, Saul RE. The spectrum of sociopathy in dementia. J Neuropsychiatry Clin Neurosci. 2011 Spring. 23(2):132-40. [Medline]. [Full Text]. Lippa CF, Cohen R, Smith TW, Drachman DA. Primary progressive aphasia with focal neuronal achromasia. Neurology. 1991 Jun. 41(6):882-6. [Medline]. Kertesz A, Martinez-Lage P, Davidson W, Munoz DG. The corticobasal degeneration syndrome overlaps progressive aphasia and frontotemporal dementia. Neurology. 2000 Nov 14. 55(9):1368-75. [Medline]. Graham NL, Bak T, Patterson K, Hodges JR. Language function and dysfunction in corticobasal degeneration. Neurology. 2003 Aug 26. 61(4):493-9. [Medline]. Whitwell JL, Jack CR Jr, Senjem ML, Josephs KA. Patterns of atrophy in pathologically confirmed FTLD with and without motor neuron degeneration. Neurology. 2006 Jan 10. 66(1):102-4. [Medline]. [Full Text]. Kertesz A, Munoz DG. Primary progressive aphasia and Pick complex. J Neurol Sci. 2003 Jan 15. 206(1):97-107. [Medline]. Geschwind D, Karrim J, Nelson SF, Miller B. The apolipoprotein E epsilon4 allele is not a significant risk factor for frontotemporal dementia. Ann Neurol. 1998 Jul. 44(1):134-8. [Medline]. Bertoux M, Delavest M, de Souza LC, Funkiewiez A, Lépine JP, Fossati P, et al. Social Cognition and Emotional Assessment differentiates frontotemporal dementia from depression. J Neurol Neurosurg Psychiatry. 2012 Apr. 83(4):411-6. [Medline]. Grossman M, Mickanin J, Onishi K, Hughes E, D'Esposito M, Ding XS. Progressive Nonfluent Aphasia: Language, Cognitive, and PET Measures Contrasted with Probable Alzheimer's Disease. J Cogn Neurosci. 1996. 8(2):135-54. [Medline]. Raj A, Kuceyeski A, Weiner M. A network diffusion model of disease progression in dementia. Neuron. 2012 Mar 22. 73(6):1204-15. [Medline]. Alladi S, Xuereb J, Bak T, Nestor P, Knibb J, Patterson K. Focal cortical presentations of Alzheimer's disease. Brain. 2007 Oct. 130(Pt 10):2636-45. [Medline]. Xiong L, Xuereb JH, Spillantini MG, Patterson K, Hodges JR, Nestor PJ. Clinical comparison of progressive aphasia associated with Alzheimer versus FTD-spectrum pathology. J Neurol Neurosurg Psychiatry. 2011 Mar. 82(3):254-60. [Medline]. Hu WT, McMillan C, Libon D, Leight S, Forman M, Lee VM. Multimodal predictors for Alzheimer disease in nonfluent primary progressive aphasia. Neurology. 2010 Aug 17. 75(7):595-602. [Medline]. Snowden J, Neary D, Mann D. Frontotemporal lobar degeneration: clinical and pathological relationships. Acta Neuropathol. 2007 Jul. 114(1):31-8. [Medline]. Diehl J, Grimmer T, Drzezga A, Riemenschneider M, Förstl H, Kurz A. Cerebral metabolic patterns at early stages of frontotemporal dementia and semantic dementia. A PET study. Neurobiol Aging. 2004 Sep. 25(8):1051-6. [Medline]. Tyrrell PJ, Warrington EK, Frackowiak RS, Rossor MN. Heterogeneity in progressive aphasia due to focal cortical atrophy. A clinical and PET study. Brain. 1990 Oct. 113 ( Pt 5):1321-36. [Medline]. Holland AL, McBurney DH, Moossy J, Reinmuth OM. The dissolution of language in Pick's disease with neurofibrillary tangles: a case study. Brain Lang. 1985 Jan. 24(1):36-58. [Medline]. Wechsler AF, Verity MA, Rosenschein S, Fried I, Scheibel AB. Pick's disease. A clinical, computed tomographic, and histologic study with golgi impregnation observations. Arch Neurol. 1982 May. 39(5):287-90. [Medline]. Graff-Radford NR, Damasio AR, Hyman BT, Hart MN, Tranel D, Damasio H, et al. Progressive aphasia in a patient with Pick's disease: a neuropsychological, radiologic, and anatomic study. Neurology. 1990 Apr. 40(4):620-6. [Medline]. Boxer AL, Miller BL. Clinical features of frontotemporal dementia. Alzheimer Dis Assoc Disord. 2005 Oct-Dec. 19 Suppl 1:S3-6. [Medline]. Byrne S, Elamin M, Bede P, Shatunov A, Walsh C, Corr B, et al. Cognitive and clinical characteristics of patients with amyotrophic lateral sclerosis carrying a C9orf72 repeat expansion: a population-based cohort study. Lancet Neurol. 2012 Mar. 11(3):232-40. [Medline]. [Full Text]. Deramecourt V, Lebert F, Debachy B, Mackowiak-Cordoliani MA, Bombois S, Kerdraon O, et al. Prediction of pathology in primary progressive language and speech disorders. Neurology. 2010 Jan 5. 74(1):42-9. [Medline]. Forman MS, Farmer J, Johnson JK, Clark CM, Arnold SE, Coslett HB, et al. Frontotemporal dementia: clinicopathological correlations. Ann Neurol. 2006 Jun. 59(6):952-62. [Medline]. [Full Text]. Forman MS, Mackenzie IR, Cairns NJ, Swanson E, Boyer PJ, Drachman DA, et al. Novel ubiquitin neuropathology in frontotemporal dementia with valosin-containing protein gene mutations. J Neuropathol Exp Neurol. 2006 Jun. 65(6):571-81. [Medline]. Josephs KA. Frontotemporal dementia and related disorders: deciphering the enigma. Ann Neurol. 2008 Jul. 64(1):4-14. [Medline]. Josephs KA, Whitwell JL, Duffy JR, Vanvoorst WA, Strand EA, Hu WT, et al. Progressive aphasia secondary to Alzheimer disease vs FTLD pathology. Neurology. 2008 Jan 1. 70(1):25-34. [Medline]. [Full Text]. Josephs KA, Whitwell JL, Knopman DS, Boeve BF, Vemuri P, Senjem ML, et al. Two distinct subtypes of right temporal variant frontotemporal dementia. Neurology. 2009 Nov 3. 73(18):1443-50. [Medline]. [Full Text]. Mott RT, Dickson DW, Trojanowski JQ, Zhukareva V, Lee VM, Forman M, et al. Neuropathologic, biochemical, and molecular characterization of the frontotemporal dementias. J Neuropathol Exp Neurol. 2005 May. 64(5):420-8. [Medline]. Neary D, Snowden JS, Mann DM, Northen B, Goulding PJ, Macdermott N. Frontal lobe dementia and motor neuron disease. J Neurol Neurosurg Psychiatry. 1990 Jan. 53(1):23-32. [Medline]. [Full Text]. Neumann M, Kwong LK, Sampathu DM, Trojanowski JQ, Lee VM. TDP-43 proteinopathy in frontotemporal lobar degeneration and amyotrophic lateral sclerosis: protein misfolding diseases without amyloidosis. Arch Neurol. 2007 Oct. 64(10):1388-94. [Medline]. Rohrer JD, Guerreiro R, Vandrovcova J, Uphill J, Reiman D, Beck J, et al. The heritability and genetics of frontotemporal lobar degeneration. Neurology. 2009 Nov 3. 73(18):1451-6. [Medline]. [Full Text]. Schymick JC, Yang Y, Andersen PM, Vonsattel JP, Greenway M, Momeni P, et al. Progranulin mutations and amyotrophic lateral sclerosis or amyotrophic lateral sclerosis-frontotemporal dementia phenotypes. J Neurol Neurosurg Psychiatry. 2007 Jul. 78(7):754-6. [Medline]. [Full Text]. Seeley WW, Bauer AM, Miller BL, Gorno-Tempini ML, Kramer JH, Weiner M, et al. The natural history of temporal variant frontotemporal dementia. Neurology. 2005 Apr 26. 64(8):1384-90. [Medline]. [Full Text].